BILLY BOB THORNTON AND THE BOXMASTERS' video "The Poor House" premiered on GAC - TV on May 6th. "The Poor House" is the lead track from The Boxmasters self-titled 2CD set to be released on Sawmill/Vanguard Records June 10th. The Boxmasters ' (W.R. 'Bud' Thornton, J.D. Andrew and Mike Butler) sound combines the influence of the Beatles, The Rolling Stones, Kinks, and the Animals, fused with Johnny Cash, Merle Haggard, Buck Owens, Roy Acuff and Hank Williams. Fashioned after a 1960's-era mod band (including matching suits and ties! ), The Boxmasters' upbeat rhythms and infectious arrangements contrast sardonically with the very dark themes they explore lyrically. 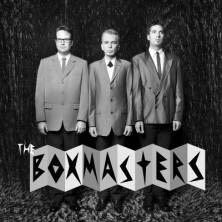 The tension that the disparity between the subject matter and the music creates lends itself to a truly unique musical experience that could only be produced by The Boxmasters. The Boxmasters will begin a cross-country tour in July. Specific tour dates to be announced shortly.